Belgrade is the capital and largest city of Serbia. The city lies at the confluence of the Sava and Danube Rivers in north central Serbia, where the Pannonian Plain meets the Balkan Peninsula. With a population of over 1.9 million (estimate 2008), Belgrade is the largest city in the territory of the former Yugoslavia and the fourth largest in Southeastern Europe, after Istanbul, Athens, and Bucharest. One of Europe's oldest cities, with a history of 7000 years, Belgrade's wider city area was the birthplace of the largest prehistoric culture of Europe, the Vinča culture. 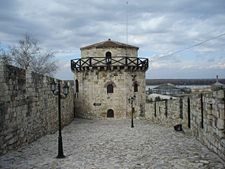 The foundation of the city itself dates back to Celtic and later, Roman periods, followed by the settlement of Slavs around the seventh century. Since ancient times it has been an important focal point for commercial traffic, an intersection of the roads of Eastern and Western Europe. Today it is the central economic hub of Serbia, and the capital of culture, education and science. The city suffered from corruption and abuse of power during the Miloševic-era, including mismanagement of the economy, as well as from years of economic sanctions, wars and damage to the infrastructure. A focus of the city's, and the nation's, leaders has been stabilization of the economic and social services systems. The government has committed itself to pursue socially accountable policy in an attempt to avoid social stratification of the population which has occurred in some former socialist countries during their periods of transition. 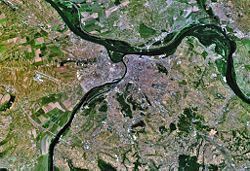 Belgrade lies at the confluence of the Sava and Danube rivers in north central Serbia, where the Pannonian Plain meets the Balkan Peninsula. There, three trade routes exist - one from Vienna to the Black Sea along the Danube River valley, another along the Sava River valley toward Trieste, and a third along the Morava and Vardar rivers to the Aegean Sea. On the right bank of the Sava, central Belgrade has hilly terrain, while the highest point of Belgrade proper is Torlak hill at 994 feet (303 meters). The mountains of Avala, at 1677 feet (511 meters), and Kosmaj, 2060 feet (628 meters) lie south of the city. Across the Sava and Danube, the land is mostly flat, consisting of alluvial plains and loessial plateaus. The Danube flows through over 37 miles (60 km) of the area, while the Sava covers nearly 19 miles (30 km). The city's riverbanks cover 124 miles (200 km). There are 16 river islands in the area, the best known being Ada Ciganlija, Veliko ratno ostrvo and Gročanska ada. Belgrade also has many wooded areas, such as Kosmaj, Avala, Trešnja, Lipovica, Topčider, Obrenovački zabran and Bojčin. Belgrade has a moderate continental climate. The hottest month is July, with an average temperature of 71.8°F (22.1°C), and the January temperature averages 34°F (1°C). Belgrade receives 27.56 inches (700mm) of precipitation a year. 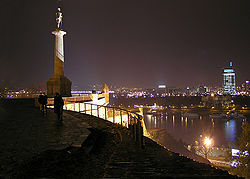 The historical core of Belgrade (today's Kalemegdan) is on the right bank of the rivers. Since the nineteenth century, the city has expanded south and east, and after World War II, New Belgrade was built on the Sava's left bank, merging Belgrade with Zemun. Smaller residential communities across the Danube, such as Krnjača and Ovča, also merged with the city. The city has an urban area of 139 square miles (360 square kilometers), while its metropolitan area covers 1244.4 square miles (3223 square kilometers). The Siege of Belgrade in 1456. Belgrade Fortress - Jakšić's Tower. The Old Palace, seat of the Assembly of the City of Belgrade. The Neolithic Starčevo and Vinča cultures existed in or near Belgrade about 7000 years ago. Settled in the fourth century B.C.E. by a Celtic tribe, the Scordisci, the city's first recorded name was Singidūn, before becoming the Roman settlement of Singidunum in the first century C.E. 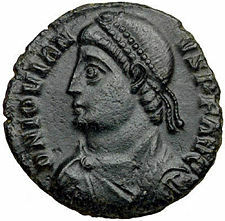 Roman Emperor Jovian (331-364), who re-established Christianity as the official religion of the Roman Empire, was born in Singidunum. In 395, the site passed to the Eastern Roman or Byzantine Empire. Across the Sava from Singidunum was the Celtic city of Taurunum (Zemun). Singidunum was invaded by Huns, Sarmatians, Ostrogoths and Avars before the arrival of the Slavs around 630. The Frankish Kingdom destroyed the Avars in the ninth century. The Slavic name Beligrad appeared around 878, during the rule of the First Bulgarian Empire. The city remained a battleground between the Byzantine Empire, the Kingdom of Hungary, and the First Bulgarian Empire for about 400 years. The city hosted the armies of the First (launched 1096) and the Second Crusades (1147–1149). While passing through during the Third Crusade (1189–1192), Frederick Barbarossa saw Belgrade in ruins. Capital of the Kingdom of Syrmia since 1284, the first Serbian king to rule over Belgrade was Dragutin (died 1316), who received it as a gift from his father-in-law, the Hungarian king Stephen V.
The Serbian Empire began to crumble after the Battle of Maritsa (1371), and the Battle of Kosovo (1389), as the Ottoman Empire conquered its southern territory. Belgrade flourished under despot Stefan Lazarević (1374-1427), who refortified the city's ancient walls, allowing the Despotate to resist the Ottomans for almost 70 years. The city became a haven for the many Balkan peoples fleeing from Ottoman rule, and is thought to have had a population of some 40,000–50,000. In 1427, Stefan's successor Đurađ Branković had to return Belgrade to the Hungarians, and the Serbian capital was moved to Smederevo. During his reign, the Ottomans captured most of the Serbian Despotate, unsuccessfully besieging Belgrade first in 1440 and again in 1456. 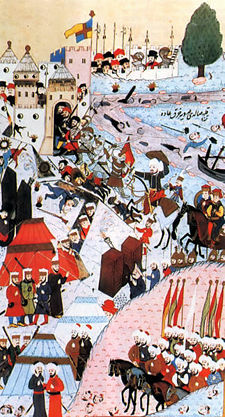 Over 100,000 Ottoman soldiers launched the famous Siege of Belgrade (July 4 to July 22, 1456), where the Christian army under John Hunyadi successfully defended the city, wounding the Sultan Mehmed II. This battle was regarded as "deciding the fate of Christendom." Sultan Suleyman the Magnificent (1494-1566) and his 250,000 soldiers captured the fort on August 28, 1521, razed most of the city, and deported its Christian population to Istanbul. Belgrade was made an Ottoman Sanjak, attracting new inhabitants—Turks, Armenians, Greeks, Ragusan traders, and others – becoming the second largest Ottoman town in Europe with over 100,000 people. Turkish rule introduced Ottoman architecture and built many mosques. In 1594, the Turks crushed a Serb rebellion. Albanian- born Grand vizier Sinan Pasha (1506-1596) is disdained by the Serbs for ordering, in 1595, that the relics of Saint Sava, the founder of the independent Serbian Orthodox Church in the twelfth century, be burned as a revenge for Serbs siding with the Habsburgs in the preceding border skirmishes. Further deportations to Istanbul followed. Habsburg Austria occupied Belgrade three times (1688–1690, 1717–1739, 1789–1791), but the Ottomans recaptured and razed the city each time. This was the period of the two Great Serbian Migrations, in which hundreds of thousands of Serbs, led by their patriarchs, retreated together with the Austrians into the Habsburg Empire, settling in today's Vojvodina and Slavonia. During the First Serbian Uprising, the Serbian revolutionaries held the city from January 8, 1806, until 1813, when the Ottomans retook the city. After the Second Serbian Uprising in 1817, Serbia reached semi-independence, which the Ottoman Porte recognized in 1830. When Serbia reached full independence in 1878, and became the Kingdom of Serbia in 1882, Belgrade became a key city, but Serbia remained overwhelmingly agrarian and poor. In 1900, the capital had only 69,100 inhabitants, by 1905 the population had grown to more than 80,000, and by the outbreak of World War I in 1914, it had surpassed the 100,000 citizens. Gavrilo Princip's assassination of Archduke Franz Ferdinand of Austria and his wife Sophie, Duchess of Hohenberg, in Sarajevo on June 28, 1914, triggered World War I. The Austro-Hungarian Army took Belgrade on November 30, 1914, but Serbian troops took the city on December 15. Belgrade fell to German and Austro-Hungarian troops on October 9, 1915. The city was liberated by Serbian and French troops on November 5, 1918. After the war, Belgrade became the capital of the new Kingdom of Serbs, Croats and Slovenes, renamed the Kingdom of Yugoslavia in 1929. The kingdom was split into banovinas, and Belgrade, together with Zemun and Pančevo, formed a separate administrative unit. Belgrade's population grew to 239,000 by 1931 (incorporating the town of Zemun, formerly in Austria-Hungary), and 320,000 by 1940. In 1927, Belgrade's first airport opened, and in 1929, its first radio station began broadcasting. The Pančevo Bridge across the Danube was opened in 1935. On March 25, 1941, the government of regent Crown Prince Paul signed the Tripartite Pact with the Axis powers to avoid war. This sparked mass protests in Belgrade and a military coup d'état led by Air Force commander General Dušan Simović, who proclaimed King Peter II to be of age to rule the realm. The German Luftwaffe bombed the city on April 6, 1941, and up to 17,000 citizens were killed. German, Italian, Hungarian, and Bulgarian forces invaded Yugoslavia. Belgrade's eastern suburbs were incorporated into a Nazi puppet state, the Independent State of Croatia, while Belgrade became the seat of another puppet government, headed by General Milan Nedić. During the summer and fall of 1941, in reprisal for guerrilla attacks, Germans carried out several massacres of Belgrade citizens; in particular, members of the Jewish community were subject to mass shootings. General Franz Böhme, the German Military Governor of Serbia, rigorously enforced the rule that for every German killed, 100 Serbs or Jews would be shot. The Allies bombed Belgrade on April 16, 1944, killing 1600 people. Communist Yugoslav Partisans and the Red Army liberated the city on October 20, 1944. On November 29, 1945, Marshal Josip Broz Tito proclaimed the Federal People's Republic of Yugoslavia in Belgrade (later to be renamed to Socialist Federal Republic of Yugoslavia on April 7, 1963). During the post-war period, Belgrade developed as an industrial center. The city's first television station began broadcasting in 1958. In 1961, the conference of Non-Aligned Countries was held in Belgrade under Tito's chairmanship. In 1968, student protests against Tito led to street clashes between students and the police. In March 1972, Belgrade was at the center of the last outbreak of smallpox in Europe. On March 9, 1991, Vuk Drašković led 150,000 people in protest against Serbian president Slobodan Milošević (1941-2006). Two people were killed, 203 injured and 108 arrested. Tanks were deployed to restore order. Further protests were held from November 1996 to February 1997 after alleged electoral fraud at local elections, bringing Zoran Đinđić to power, the first non-communist mayor of Belgrade since World War II. NATO bombing during the Kosovo War in 1999 caused substantial damage to Belgrade. After the elections in 2000, street protests by over 800,000 people resulted in the ousting of Milošević, on October 5, 2000. Map of the municipalities of Belgrade. Serbia is a parliamentary representative democratic republic. The chief of state is the president, elected for a five-year term, and the prime minister is the head of government, and of a multi-party system. The unicameral Serbian national assembly, which has 250 members, elects the prime minister. The part of Serbia that is neither in Kosovo nor in Vojvodina, often called "Serbia proper," is divided into 29 districts plus the City of Belgrade. As a separate territorial unit, Belgrade has an autonomous city government. The Civic Assembly of Belgrade has 110 councilors who are elected for four-year terms. The 2008 majority parties are the same as in the Parliament of Serbia. The city is divided into 17 municipalities, 10 with "urban" status, and seven with "suburban" status. While each has its own local council, the suburban municipalities have slightly expanded powers, regarding construction, town planning and public utilities. 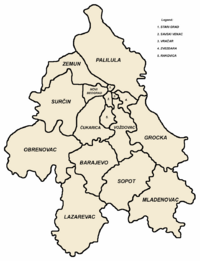 Most municipalities are on the southern side of the Danube and Sava rivers, in the Šumadija region. 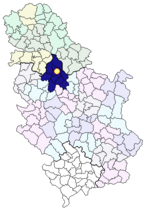 Zemun, Novi Beograd, and Surčin are on the northern bank of the Sava, and Palilula, spanning the Danube, is in both the Šumadija and Banat regions. The National Bank of Serbia, near Slavija Square. Faculty of Electrical Engineering, Architecture and Civil Engineering, University of Belgrade. Belgrade is the most economically developed part of Serbia. The rocky transition from the former Yugoslavia to the Federal Republic during the early 1990s left Belgrade, like the rest of the country, harmed by an international trade embargo and hyperinflation. Yugoslavia overcame the problems of inflation in the mid-1990s. By 2008, over 30 percent of Serbia's GDP was generated by the city, which also has over 30 percent of Serbia's employed population. In terms of GDP per capita, Belgrade holds the region's top position, with a figure of $US18,204 in terms of purchasing power parity. Many notable companies are based in Belgrade, including Jat Airways, Telekom Srbija, Telenor Serbia, Delta Holding, regional centers for Société Générale, Intel,Motorola, Kraft Foods, Carlsberg, Microsoft, Zepter, Japan Tobacco and many others. Belgrade is a media hub. The city hosts the headquarters of the national broadcaster Radio Television Serbia - RTS, the RTS record label is based there, as is commercial broadcaster RTV Pink. High-circulation daily newspapers published in Belgrade include Politika, Blic, Večernje novosti, Glas javnosti, Press and Sportski žurnal. Belgrade has an extensive public transport system based on buses (118 urban lines and more than 300 suburban lines), trams (12 lines), and trolleybuses (eight lines). Belgrade has a commuter rail network, Beovoz. Travel by coach is popular. The motorway system provides for easy access to Novi Sad and Budapest in the north; Niš to the south; and Zagreb, to the west. 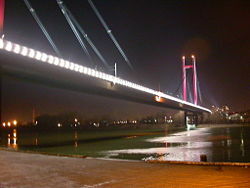 Belgrade has numerous bridges—the two main ones being Branko's bridge and Gazela, both of which connect the core of the city to Novi Beograd (New Belgrade). The Port of Belgrade is on the Danube. The city is also served by Belgrade Nikola Tesla Airport, 12km west of the city center. At its peak in 1986, nearly three million passengers traveled through the airport, though that number dwindled to a trickle in the 1990s. In 2007, 2.5 million passengers passed through. Traffic congestion has become a problem. This was expected to be alleviated by the construction of a bypass, an "inner magistral semi-ring," and new bridges across the Sava and Danube rivers. Belgrade had 1,531,741 eligible voters in December 2007, according to the city's Institute for Informatics and Statistics. The number of registered voters nearly exceeded the entire population of the city six years earlier. Belgrade has attracted people of varied ethnicity, who went there seeking a better life, or who fled as refugees from war and ethnic cleansing. The main ethnic groups are Serbs (1,203,045), Montenegrins (25,000), Roma (19,000), Croats (7000), Macedonians (8372), and Muslims by nationality (4617). Belgrade is home to up to 20,000 Chinese, who began moving there in the mid-1990s. Blok 70 in New Belgrade is known locally as the Chinese quarter. Many Middle Easterners, mainly from Syria, Iran, Jordan and Iraq, arrived to study during the 1970s and 1980s, and have remained. Afghani and Iraqi Kurdish refugees are among some of the recent arrivals from the Middle East. The Serbian language is the official language. Other languages include Romanian, Hungarian, Slovak, Ukrainian, and Croatian. Many are able to communicate in English as well, though somewhat limitedly. The Serbian Orthodox community is by far the largest, with 1,429,170 adherents. There are 20,366 Muslims, 16,305 Roman Catholics, and 3796 Protestants. There was once a significant Jewish community, but following the Nazi occupation, and many Jews' subsequent emigration to Israel, their numbers have fallen to a mere 515 (2008). Belgrade has two state universities and several private institutions for higher education. The "Great School," founded in Belgrade in 1808, was the earliest location of higher education in Serbia. The Lyceum followed in 1841, when it was moved from Kragujevac. By 1905, it had evolved into the University of Belgrade, which has more than 70,000 students. Temple of Saint Sava and the National Library of Serbia. Skadarlija, located in the municipality of Stari Grad (Old town), and considered the main bohemian quarter of Belgrade. More traditional Serbian nightlife may be experienced there, accompanied by traditional music known as Starogradska. Skadar Street (the center of Skadarlija) and the surrounding neighborhood are lined with some of Belgrade's best and oldest traditional restaurants (called kafanas in Serbian). The neighborhood has Belgrade's oldest brewery, founded in the first half of the nineteenth century. The National Museum, founded in 1844, houses a collection of more than 400,000 exhibits,(over 5600 paintings and 8400 drawings and prints) including many foreign masterpieces and the famous Miroslavljevo Jevanđelje (Miroslav's Gospel). The Military Museum, which houses a wide range of more than 25,000 military exhibits dating as far back as to the Roman period, as well as parts of a F-117 stealth aircraft shot down by Yugoslav forces. Zemun, which is considered by the local population as a separate, and more cultural city than Belgrade. Belgraders consider Zemun an outer, Austro-Hungarian suburb of Belgrade. Nikola Pašić Square, is one of the central town squares, is named after Nikola Pašić who served as mayor of Belgrade, prime minister of Serbia and prime minister of Yugoslavia. The Kalemegdan Fortress, is the core and the oldest section of the urban area of Belgrade and for centuries the city population was concentrated only within the walls of the fortress. Knez Mihailova St, the favorite strolling avenue of the city. 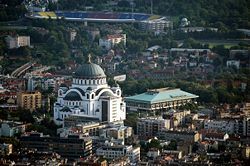 The Temple of Saint Sava is the largest Orthodox church in use in Belgrade. The Yugoslav Film Archive, with around 95,000 copies of films, is among the 10 largest archives in the world. The city was one of the main centers of the Yugoslav New Wave music in the 1980s. 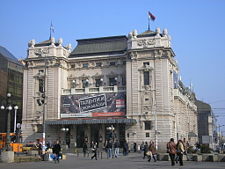 There are numerous theaters, the most prominent of which are National Theatre, Theatre on Terazije, Yugoslav Drama Theatre, Zvezdara Theatre, and Atelier 212. 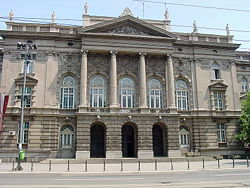 Belgrade's two opera houses are: National Theatre and Madlenijanum Opera House. After Serbia's Marija Šerifović won the Eurovision Song Contest in 2007, Belgrade hosted the Eurovision Song Contest 2008. There are numerous parks, monuments, cafés, restaurants and shops. Belgrade hosts the Belgrade Film Festival, Theatre Festival, Summer Festival, Music Festival, Book Fair, and the Belgrade Beer Festival. There are approximately a thousand sports facilities in the city. Since its original settlement as the Roman city known as Singidunum, Belgrade has arisen (according to legend and verified history) from its ashes 38 times. Located at the convergence of three historically important routes between Europe and the Balkans—east-west along the Danube River valley from Vienna to the Black Sea; westward along the valley of the Sava River toward Trieste and northern Italy; and southeast along the valleys of the Morava and Vardar rivers to the Aegean Sea—has given it a history of possession by various foreign powers. Its location has enabled it to play an important role in several junctures in history. The Balkan Peninsula, on which Belgrade lies, is a mélange of cultures and ethnicities. The virulent animosity among different groups has led to civil war, and to the area's nickname as the "Balkan tinderbox." Belgrade, emerging from an era of war and repression is, in the early twenty-first century, a work in progress. Its history has shaped it, yet it is up to its leaders and contributing citizens to determine its future. Pobednik (The Victor), a symbol of Belgrade. While the city, along with the entire nation, suffered from corruption and abuse of power during the Miloševic-era, since that time its leaders have focused their efforts on the stabilization of the economic and social services systems. The government has committed itself to pursue socially accountable policy in an attempt to avoid social stratification of the population which has occurred in some former socialist countries during their periods of transition. The City of Belgrade has received various domestic and international honors, including the French Légion d'honneur in 1920, the Czechoslovak War Cross, the Serbian Karađorđe's Star with Swords and the former Yugoslavian Order of the National Hero (proclaimed on October 20 1974, the anniversary of the overthrow of Nazi German occupation during World War II). The country is in the process of negotiating the Stabilization and Association Agreement with the European Union, and is the world’s leading reformer as stated by the World Bank. In addition, the pace of structural reforms is ahead of that in other transition countries according to the European Bank for Reconstruction and Development. As a leading educational center comprising 62 university-level institutions, Belgrade boasts a well-educated, fast learning, multilingual and IT literate labor force. Over 8,000 students graduate from Belgrade University every year, with one-third of them adding to the traditionally strong engineer base. According to Gallup International, the city's percentage of English speakers is the highest in Central and Eastern Europe, and an increasing number of western business schools open their affiliates in Belgrade. These statistics show Belgrade's determination to join the ranks of progressive European cities. A critical issue will be its capacity to reconcile the major ethnic factions that define its current identity. ↑ Ancient Period. City of Belgrade. Retrieved March 16, 2012. ↑ Territory. City of Belgrade. Retrieved March 16, 2012. ↑ Geographical position. City of Belgrade. Retrieved March 16, 2012. ↑ 2011-11-15, PRVI REZULTATI, Konferencija za novinare, Statistical Office of the Republic of Serbia Retrieved March 16, 2012. ↑ City of Belgrade. Received Decorations Retrieved August 12, 2008. ↑ The Financial Times Limited. February 06, 2006. European Cities of the Future 2006/07 Retrieved August 12, 2008. City of Belgrade. Belgrade Retrieved July 30, 2008. This page was last modified on 1 June 2016, at 20:13.